What Would Happen to Your Body If You Only Ate Candy Corn? Candy corn is garbage food, and it’s terrible for you, too. Still, as per tradition, millions of Americans purchased hefty bags of the stuff over the weekend to hand out to trick-or-treaters and snarf when their loved ones weren’t looking. For most of us, a handful of candy corn is more than enough to satisfy the regretful, late October craving. But today is Halloween, a day for morbid hypotheticals. So the question I decided to pose is this: What would happen if you only ate candy corn, forever? The short answer is, you’d die. But not before putting your body through a dozen different forms of hell. 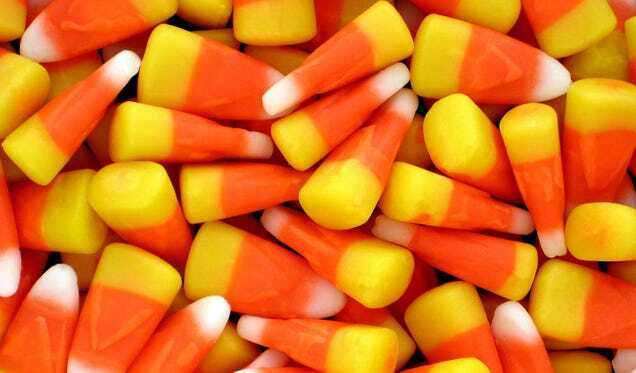 Candy corn is basically empty calories: A mixture of corn syrup, honey, and table sugar, plus some artificial color, a dash of gelatin and a pinch of salt. A 19 piece, 140 calorie serving of Brach’s candy corn contains zero grams of fat, 70 milligrams of salt, and 28 grams of sugar. Insofar as this substance could satisfy your daily energy requirements, you could absolutely live off it. To achieve a 2,000 calorie/day diet, you’d need to eat about 14 servings of Brach’s, or 271 individual pieces of candy corn. That’s 400 grams of sugar per day, and pretty much nothing else. The obvious problem with this diet is malnutrition. You’re consuming way too much sugar—the American Heart Association’s daily recommended limit is 25 grams—and none of the other vitamins, minerals, proteins, or fibers a healthy human needs. “You’d probably develop scurvy, and all sorts of other wonderful nutritional deficiencies” Hans Plugge, a senior toxicologist at 3E Company, told me when I asked him what a pure candy corn diet would do to a person. Scurvy, a disease triggered by a lack of vitamin C, results in a general feeling of fatigue and malaise. Without treatment, scurvy can reduce the body’s red blood cell count and lead to problems with wound healing. Eventually, a person with scurvy might die of infection or excess bleeding. Plugge added that eventually, your bones would become weak and porous due to a lack of key minerals, and your muscles would start to waste from a lack of protein. Regarding the lack of fiber, “you’d probably have all sorts of GI problems,” he said. David Levitsky, a professor of nutritional sciences at Cornell University, says that protein deficiency would eventually do you in, but that it would take a long time. On average, if a person has water but doesn’t eat at all, it takes him about a month to use up his body’s excess energy reserves and starve. For the aforementioned reasons, those few weeks would not be fun. A sugar-only diet would also lead to rapid tooth decay, and cause your blood glucose levels to spike and fall repeatedly, exacerbating your scurvy-induced fatigue. You’d probably be in a rotten mood. If you become diabetic, and you continue eating nothing but candy corn, you may develop hyperglycemia, slip into a diabetic coma, and die. Levitsky, however, is doubtful that this particular fate awaits a person who only eats enough sugar to satisfy his caloric needs. “Diabetes, hypertension, and other [long-term] illnesses stem from eating too many calories,” he said. Of course, you could always end the misery early, by beasting a lethal dose of Satan’s corn. Last week, the American Chemical Society released an enlightening video (above) that shows us how to estimate that dose for our own bodies, by using sugar’s LD-50 value. That’s the quantity per kilo of a substance that should kill a subject, if ingested all at once. To close out this macabre thought experiment, I’d like to offer readers a quick sanity check: No matter how much you think you enjoy eating spray-painted earwax, your body almost certainly won’t let you die from it.